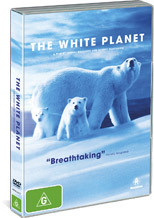 The White Planet is a film by Thierry Ragobert and Thierry Piantanida which is one of the most wondrous documentaries that I have had the pleasure of watching in quite some time which revolves around the various creature of the Arctic. The documentary takes the viewer through the harsh seasons of this winter wonderland and gives the viewer a true insight into these majestic creatures who live in this almost perpetual cold climate. What really makes this documentary so interesting is the amazing of footage of creatures I didn't know that existed and it was almost like watching aliens on another planet. From the majestic whales that come thousands of miles to these Arctic oceans or the wolves that roam this inhospitable land, this documentary gives you everything and more which will leave you wanting more. Truly inspirational! The unfortunate aspect of this documentary is that the Arctic is threatened by man's tampering of the world which may one day see this ice kingdom destroyed. Hopefully the documentary can inspire others to assist in saving this amazing ecosystem. Featured in glorious 16:9 widescreen and Dolby Digital, this is as close as most of us will ever get to experiencing this beautiful side of Earth.